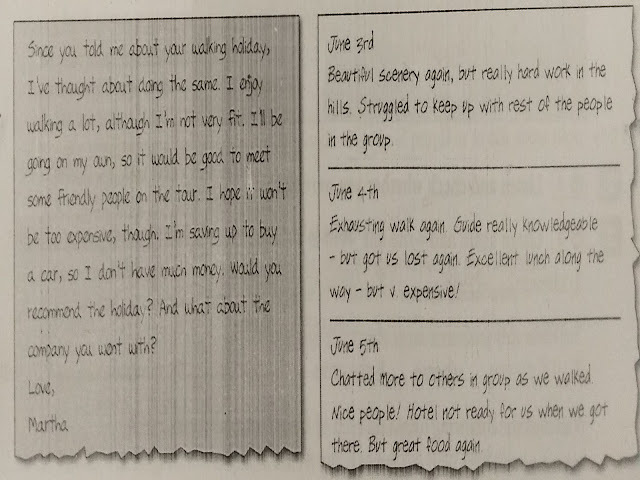 Unit 3: Writing Task - Last year you went on an organised walking holiday for a week, walking along a long-distance footpath to a different hotel each night. A friend has written to you asking whether you would recommend the holiday that you went on and the company who organised it. Read the extract from your friend's letter and some extract from the diary you wrote during your holiday. Write a letter to your friend saying what you thought about the holiday, how it could have been better, and weather you would recommend the holiday and the company. Write your letter in 180-220 words. Do not write any postal address. Dear Martha, I’m glad I’ve received your message today, I had a lovely time in Italy, however I don’t think this is the right holiday for you. an outline of why it would be a good thing to reduce car usepossible ways of achieving thisproblems in introducing changesyour recommendations on what should be done.Write your proposal in 300-350 words. The problem The majority of the company’s employees make use of private cars to go to work despite the existence of public transport. Unit 2: Writing Task - You are on the committee of an organisation called Sport for Youth, which encourages young people to become more involved in sports. The next annual conference will be held in your home town. Delegates have received a provisional programme, but you nee to write a letter to them shortly before the conference giving them further details about the first day, and suggesting what they might do in the evening. Read the provisional programme and some notes you took at a recent meeting of the organizing committee. Write a letter to delegates in 180-220 words. I am very pleased to welcome you to the 15th Annual Conference of Sport for Youth which will be held in the ExCel, London from the 12th to the 15th of December. A programme for the the first day was provided and here are some final details aiming at making your experience at the Conference as enjoyable as possible. Unit 1: Writing Task - You have recently read an article in an English language magazine aimed at young adults, which reported a survey finding that television was considered to be the most important invention of the last 100 years. You decide to write an article arguing that another invention has had as great an impact. Describe the invention and the impact it has had on our world, and say why you think it is a more important invention than television. One can argue that the television, our sole mean of virtual entertainment for many years, was the most important invention of the last 100 years. This, however, is overshadowed by the invention of the Internet. This becomes clear when we consider that, nowadays, the usage of the latter is more present in everyday life than the former.